The year is 1819, and the renowned chef Owen Wedgwood has been kidnapped by a beautiful yet ruthless pirate. He will be spared, Mad Hannah Mabbot tells him, as long as he can conjure an exquisite meal every Sunday from the ship's meager supplies. While Wedgwood attempts to satisfy his captor with feats such as tea-smoked eel and pineapple-banana cider, he realizes that Mabbot herself is under siege. Hunted by a deadly privateer and plagued by a saboteur, she pushes her crew past exhaustion in her search for the notorious Brass Fox. But there is a method to Mabbot's madness, and as the Flying Rose races across the ocean, Wedgwood learns to rely on the bizarre crew members he once feared: a formidable giant who loves to knit; a pair of stoic martial arts masters, sworn to defend their captain; and the ship's deaf cabin boy, who becomes the son he never had. 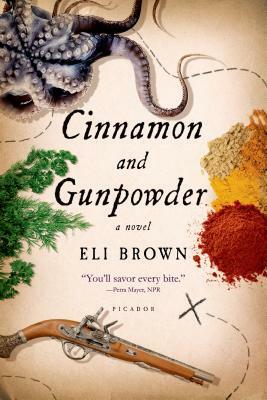 An anarchic tale of love and appetite, Eli Brown's Cinnamon and Gunpowder is a wildly original feat of the imagination, deep and startling as the sea itself. Eli Brown lives on an experimental urban farm in Alameda, California. His writing has appeared in The Cortland Review and Homewrecker: An Adultery Reader. His first novel, The Great Days, won the Fabri Literary Prize.